We were now standing on the small T junction between the two platforms, which we could see had now been bricked off. I wondered what it must have felt like to live, sleep and work in such an area with trains passing immediately behind the wall. On cue, a train approached. First we felt a strong draft of wind, then heard a rumble. The rumble became louder until It was impossible to hear what anyone was saying! The modern looking sign is a recent addition to help line workers orient themselves on arrival. At this point a sign on the wall revealed that we were almost exactly half way between Green Park and Hyde Park Corner - Green Park was 480 metres eastbound and Hyde Park Corner was 475 metres westbound. 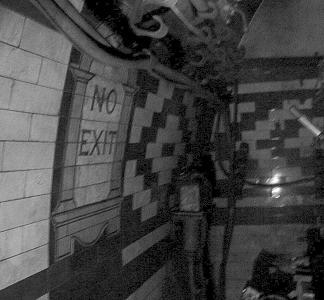 We were then led onto what originally would have been the eastbound platform, though in the late 1930s, it had been bricked up for almost its entire length save the small door sized grilles. Turning left into a small corridor, we were led into a small room, which contained some switches and some dials. Strangely, everything in this room was painted grey. Everything. The switches, the walls, even the glass on the dials were painted grey. Bizarely even the light fitting... and the light bulb was also covered in grey paint! One can only speculate why everything needed to be painted grey; possibly a zealous soldier when the place was being decommissioned after the war taking an order to "paint everything grey" a little too literally...? The purpose of this room was to provide the electrical switching necessary to switch between the electricity main and the emergency generator. 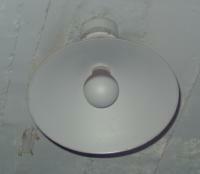 The "Grey switch room" and the grey light bulb. 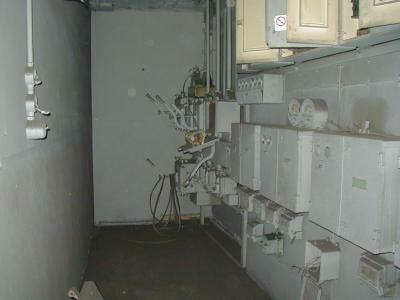 On from the grey room, we were led into a small room, which contained telephone-switching equipment. This was the communications exchange for the complex and any calls made to and from the offices would have been routed through here. Although left almost intact at the end of the war, this equipment was now clearly derelict. 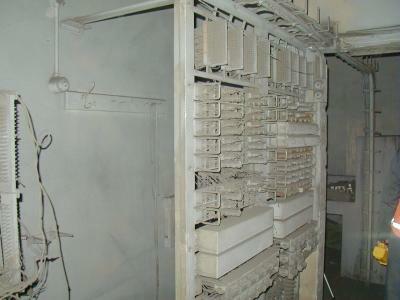 A thick layer of dust now covered all the surfaces and switching relays and the operator's desk was falling apart. I wondered what important and historic phone calls were passed through these now decaying circuits. At the end of this short corridor was a doorway. This opened directly out onto the tracks and although locked, a quick look through its keyhole clearly revealed another use for the station since its closure; a small portion of the west end of the station had been completely removed to provide access to another tunnel, built soon after the station closed, situated between the main two running tunnels - a siding where broken trains could be moved to, or where trains could be reversed. The dust raised when trains approached (and when we moved around) was almost choking - one imagines what the pressure wave would have been like if the door was open as trains passed! 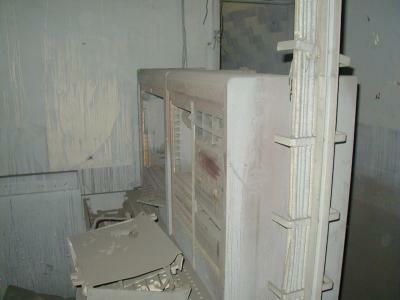 Apparently 70% of the dust found in these abandoned stations is made up of human skin and hair! Through the keyhole! What you're seeing here isn't the main line but it is in fact the siding built between the two tracks. 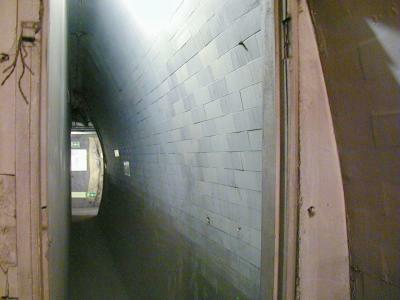 Along the curved tunnel wall of this room, through the grey paint the original station tile pattern could dimly be seen. 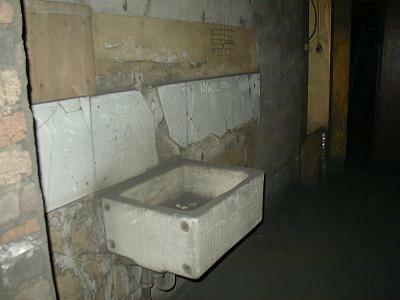 This was one of the only places in the station where the original decoration hadn't been completely obliterated. 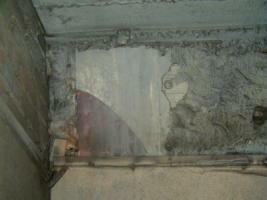 Here also, someone had carefully removed the paint revealing a perfectly preserved "Way Out" cartouche. We then carried walking along the old East platform into another bricked off area. This we were told was the old officers' mess, complete with wallpaper and the remains of a button that would have been used to summon the staff! A little further on we came to the kitchen area itself. Although most of the cooking equipment had been removed there were marks on the wall where things had obviously been stored and a sink unit remained intact in one part of the kitchen. On the splashguard above the sink I was very surprised to read written recently in the dust "Hywel 2000" - so another person bearing my name has recently visited this complex! Further down and we came to another crossover passage similar to the one in which we'd entered the platform level - this one also bearing a stairway, which would have served as the station's entrance from the lift shaft. 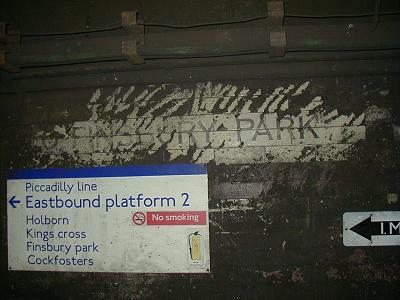 Some old signs could be read through the partially removed brown paint telling passengers which platform to go to if they wanted to go in the direction of Hammersmith or Finsbury Park (then the terminating points of the Piccadilly Line). Before climbing up the stairs we went a little further down the platform area. We passed some signalling equipment (behind locked doors) which had been installed in the 1950s to enable the sidings area mentioned earlier to be controlled remotely and then entered through one of the old platform cross over passageways, into a small cubicle on the opposite platform, which had been built and decorated as an officer's bedroom during the War. These small rooms had been built along the length of the westbound platform. Just above the entrance, a small triangular fragment of the station's original bull's eye name board could be seen. This would have taken the form of a red circle with a blue strip bearing the station's name "DOWN StrEET (for Mayfair)". The red circle with a white centre familiar to today's traveller only came later. Walking out into the narrow corridor between the small cubicles, to our left we could see the way that led to the small stub of a platform that was left there for emergency access during the War- in fact this would have been one of the main routes of access to the station, where a train could be hailed by activating a manual signal situated on the platform. The train would stop allowing people to board from the small platform. Access to this platform was now blocked. This area was the only part of the whole complex at track level that actually looked like it belonged on the Underground. 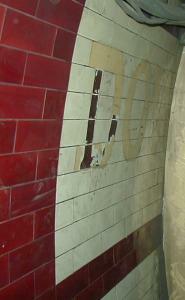 Sections of the walls still bore the original tile unique station tile pattern and in one place the start of the word "Down Street" could be observed. The rest of the platform area had in fact been bricked off from the tracks for its entire length so the only sign we had of the proximity of the railway was the rather loud noises coming from passing trains. Incredulously, this small stub platform has been used as a filming set. In 1996, the BBC broadcasted a series called Neverwhere, written by the dark comic Sandman's writer Neil Gaiman. 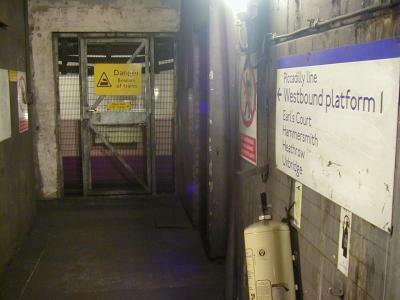 Much of the series takes place in a place that exists neither above nor below London, but in a dark underworld inhabited by many characters who take their name from Underground Stations. The scene where the series' main protagonists wake up in Serpentine's house was filmed on this stub platform! Close examination of the film reveals that some form of Perspex sheeting was laid along the platform walls to protect the actors from the fast moving trains but Piccadilly Line trains can clearly be seen zooming past in the background. Apparently, several riders of the line during filming, on seeing the eerie figures in strange costumes through the windows as they passed the location, reported to Underground staff that they'd seen ghosts! Back to the second stair access, we then walked up the stairs and along another corridor very similar to the one we had first walked down from the spiral staircase except this one had no lights! Turning the corner at the end we were confronted by the gaping doorways into the old lift shaft. 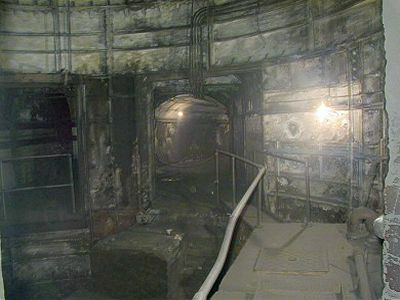 There would have once been two lifts that would have been the passenger's main access to the station but now the shafts were empty. 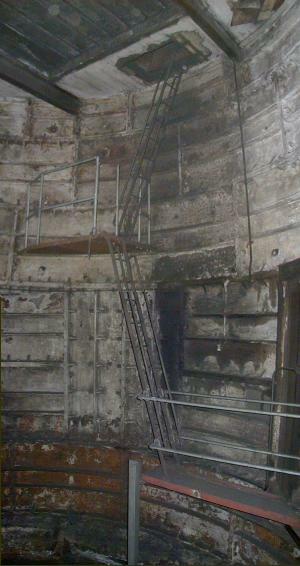 During the war, three baffles of reinforced concrete had been installed in the shaft at regular intervals and a small rickety staircase installed to allow access into the space between the baffles. A metal bridge had been built across the sump of the shaft and we proceed over this bridge. Beneath the bridge, the remains of an old fan could be seen lying on the floor that was part of the original ventilation system for the complex. This was one of the first air-conditioned places in Britain, where the air could be purified, warmed or cooled as needed. The complex operated on a positive pressure basis - the pressure inside the sealed area was always greater than the outside. That way, any poisonous gases wouldn't leak into the site. The ventilation system was very similar to that being installed on battle ships of the day. As trains passed, the difference in air pressure could clearly be heard through the baffles. 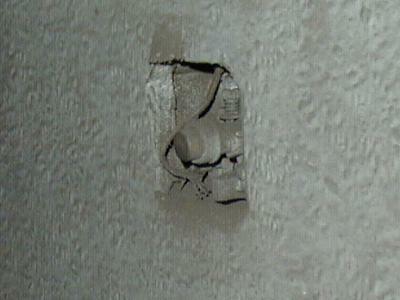 Since the concrete plug only had some small holes bored into it to allow the air through (each baffle having the holes in different locations around its circumference so that a bomb wouldn't penetrate), as a train approached the air rushing up the lift shaft built into a loud roar of rushing wind as it was forced through the relatively small holes in the baffles - quite a spectacular noise! Then we heard the rumble of the train passing down at platform level and the sound demonstration was again repeated as now air was being sucked back down the tunnels! Listen here to an mp3 (1:35 minutes, 1.48MB) of the sound made by the wind rushing through the lift shaft. The recording was made using a crossed microphone pair and so sounds best through a good pair of headphones. 0:00 Starting off with silence - a transformer hum can be heard from distant signalling equipment. 0:06 An initial rush of air is heard as air starts being pushed through the baffles in the lift shaft. 0:23 The rush of air becomes a roar, as more air is pumped through the shaft by the piston action of a train running down the tunnels below. 0:42 The wind dies down and a train can be heard passing through the station in the distance. It's a little louder than in real life as the microphones were picking up vibrations through the floor. 0:54 The wind starts again - now it's being sucked back down the shaft as the train moves away down the tunnel. 1:32 Back to silence again. For those familiar with the BBC's version of Neil Gaiman's Neverwhere series, the scene in episode 1 where Door is being chased by Mr. Croup and Mr. Vandemar up a narrow rickety staircase near the beginning was filmed in this lift shaft. I can only guess they had to film in short bursts between the roaring of the shaft, or they filmed at night when no trains were running! It also must have taken some guts to climb up that staircase as it looked as if it could collapse all by itself! Through a small door on the other side of the lift shafts and we were back out again at the foot of the emergency spiral staircase. All that remained for us to do was walk back up the spiral staircase. 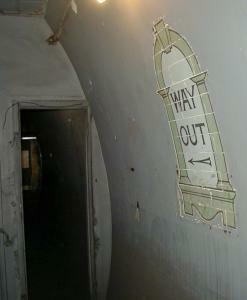 For the time being, no further tours of Disused Stations are being arranged by London's Transport Museum. They are very much aware that there are many people who'd love to visit - and have not ruled out tours in the future, but remember that even when they were arranging the tours, the vast majority of people who applied were turned away due to the small number of people that could attend each tour. Afterthought... When I visited this station to take the photographs you can see on this page, there were only two of us there - myself and my guide from LuL. Let me tell you this place isn't for the faint-hearted if you're easily spooked! There were many times we appeared to hear bangs and shuffling sounds coming from directions that we knew no noises should be coming from. 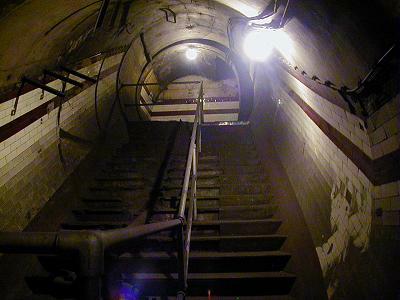 As I was setting up the DAT recorder to record the lift shaft sounds above, I heard a woman's laugh coming from a tunnel, which lead down to the tracks/platform level. I thought nothing of it as I was wearing headphones and monitoring levels. Headphones often play tricks with the stereo image making sounds appear from unexpected directions. Then my guide entered the lift shaft from another tunnel... he'd also heard the laugh down a completely different tunnel, also coming from the track/platform... Spooooky! Unfortunately, the tape wasn't running at the time so no recording of this sound was made. You can imagine the trepidation I felt when later listening through the 30 minutes of recording I'd made when I left the recorder in the lift shaft alone while we went off to photograph... Also, the pictures make the place look well lit - it isn't. The majority of the station complex is in complete darkness, lit only by our torches! A brief note about this page. Although made out to look like a single visit, this page contains descriptions and photographs taken over three visits to the station. The text (and most of the factual description of the tour) are from when I visited during a London's Transport Museum tour on December 9th 2000 and on another visit on 21st August 2001. The photographs were taken on October 19th 2001 during a visit especially arranged for the purpose of visually recording the location. Although taken nearly a year after the original tour described in the text, absolutely nothing seemed to have had changed! The camera used is an 920 digital camera and is fantastic at taking pictures in very low lighting. Several sections of the station had a no flash rule due to close proximity to the very much active Piccadilly Line and in some of the shots, the camera excelled itself to the point of making some of the places look much brighter than they actually were! I tried not to use the flash as much as possible to capture the atmosphere of this place, but there are many places with no lighting whatsoever and in these cases, the use of flash was unavoidable. All pictures are © 2001. All material on this page is © 2001-2003 Hywel Williams unless otherwise noted.